Villa Almarik is a resort hotel located on the island of Gili Trawangan, northeast of Lombok. Gili Trawangan is wellknown among tourists as a diving spot and as the most developed of the three Gili islands with numerous hotels, villas, homestays, and restaurants. Under a new management, Villa Almarik decided to develop its beach front and add a new dining facility. The young architect Effan Adhiwira suggested a few specific issues. 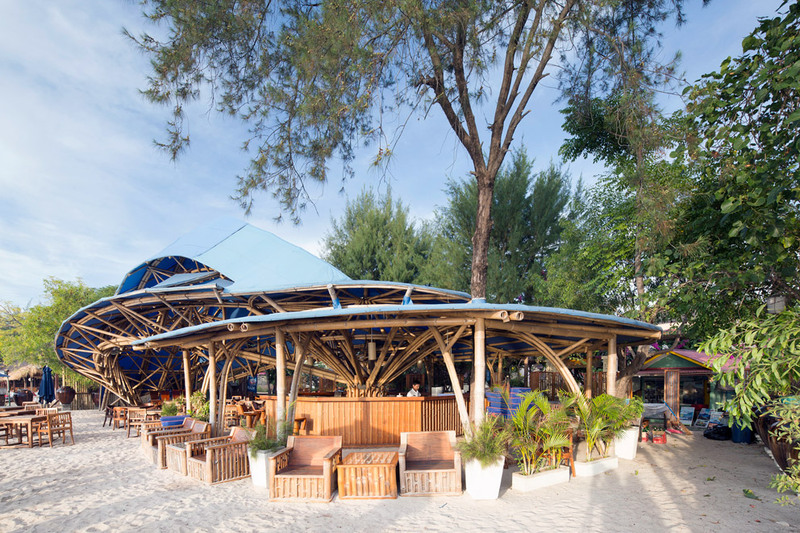 First, the building should form an eye-catcher on the Gili Trawangan beach line. Second, it should require elaborate foundations on the sandy beach as according to local regulations, the structure should be temporary – easy to dismantle – and made of lightweight materials. Third, despite its lightweight structure, it should be able to withstand strong winds. 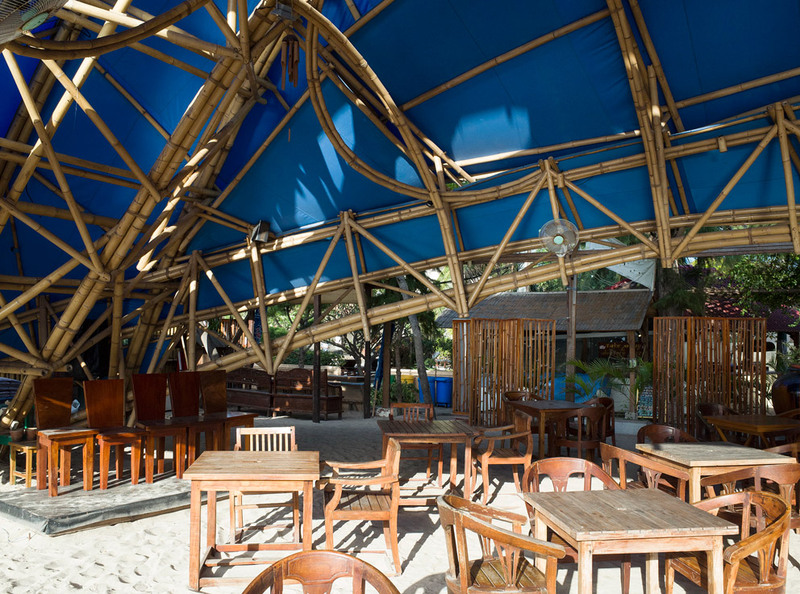 Adhiwira devised a widespan bamboo shade which put the pilings in two opposing positions. The composition enabled him to minimize the piling on the beach and afforded a clear ground plan for the restaurant. To achieve this, he utilized a set of three bamboo trusses working together as a support for the shed. 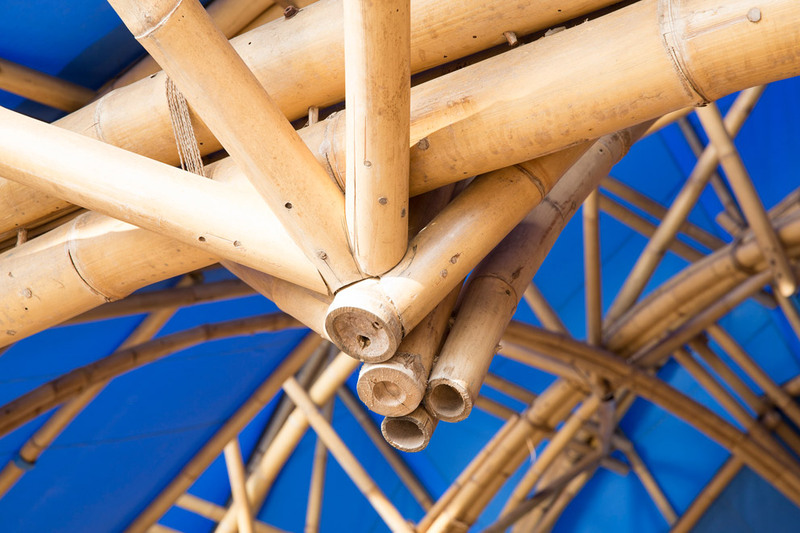 Two kinds of bamboo are used as the trusses: large-diameter bambu petung (Dendrocalamus asper) for the main beams and slender bambu tali (Gigantochloa apus) for the tie beams. The roof is made of a canvas membrane to save weight. 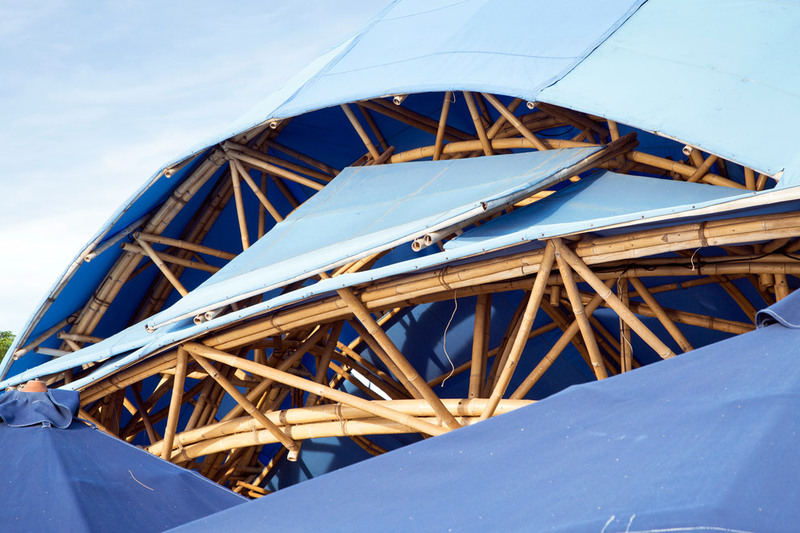 To counteract the frequent winds, the roof consists of several pieces with gaps in-between allowing strong winds to pass through. It adds to the complexity of the unpredictable form of the roof while bringing light into the middle section. Added to the composition, the lower projecting canopy surrounding the bar provides shelter for sunbathers on the recliners. Effan Adhiwira graduated from Universitas Gajah Mada, Yogyakarta, in 2005. He joined Toma House in 2005, and developed a prototype for a prefabricated house with an aluminum structure combined with local organic materials. From 2007 to 2011, he worked at PT Bamboo Pure/ IBUKU Design constructing the renowned Green School in Ubud under John Hardy. 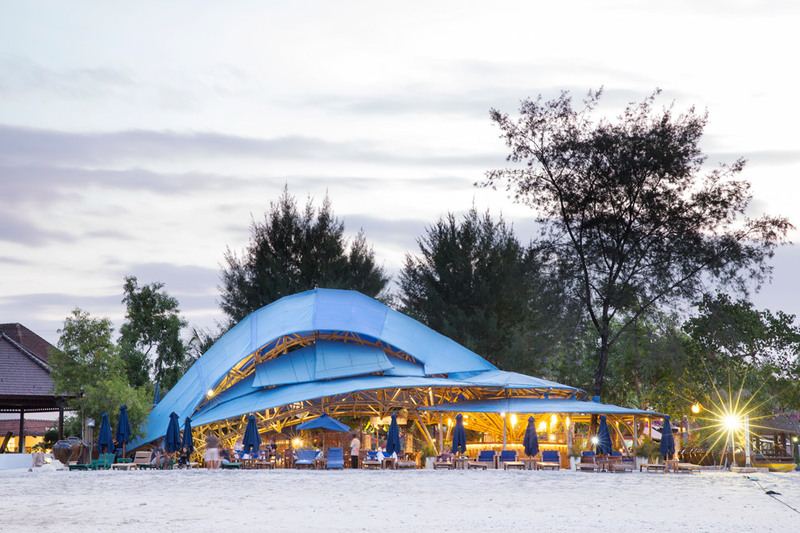 After attending a summer course at the Architectural Association in London in 2011, Effan returned to Indonesia and subsequently established his own practice in Denpasar, Bali. Effan and his young collaborators produce a promising body of work consisting of daring bamboo structures and the creative use of local organic materials. His company caters mostly to the hospitality sector, such as restaurants, bars, wedding chapels, and beach huts – and he recently even designed an office building in a similar manner. The construction was designed by EFF Studio. The structure is at the center of the design. To counteract the frequent winds, the roof consists of several pieces with gaps in-between allowing strong winds to pass through. 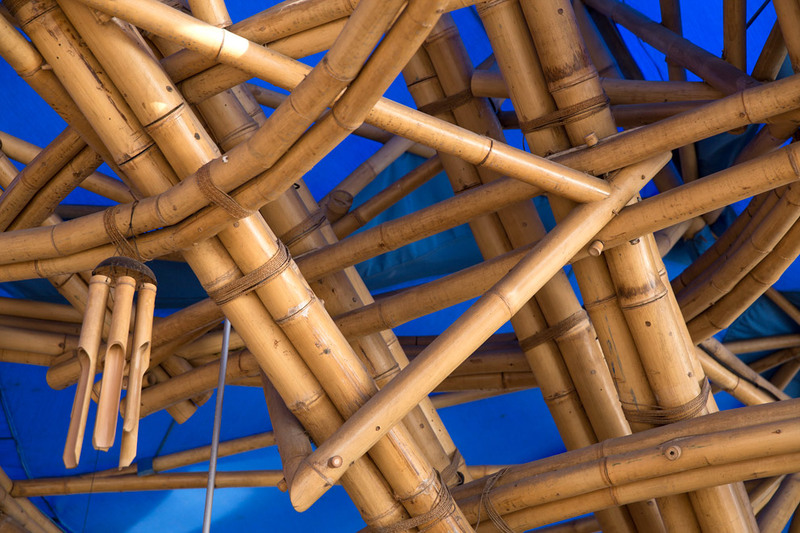 Bamboo is not yet widely used in Indonesia as a construction material. The roof is made of a canvas membrane to save weight. 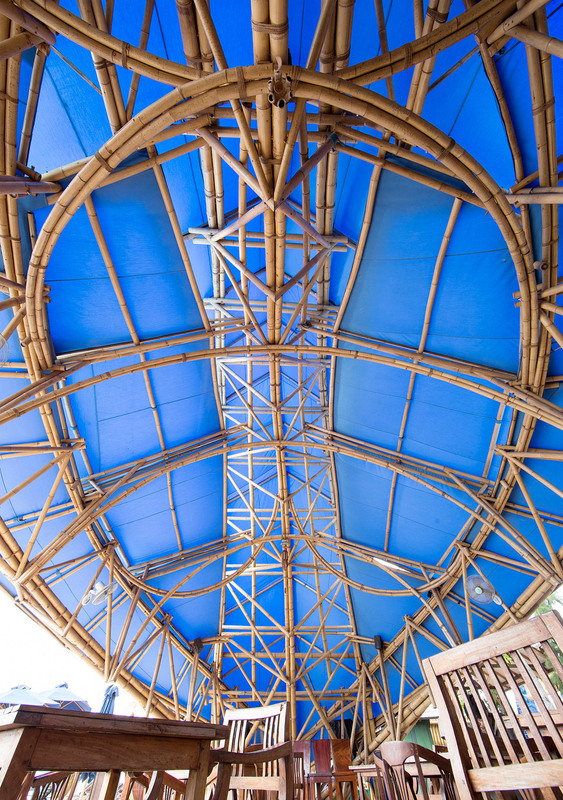 Two kinds of bamboo are used as the trusses: large-diameter bambu petung (Dendrocalamus asper) for the main beams and slender bambu tali (Gigantochloa apus) for the tie beams.